What’s the difference between Buffalo and Antarctica? Antarctica didn’t lose four Super Bowls in a row. I’ve heard jokes like these my entire life. I learned that outside of choking in the big game, we are known for wings and snow. What the public at large doesn’t know is that Buffalo is a pretty tight knit place. The people are rebuilding the City from the ground up. That’s really where the idea for Voodoo and Burnt Rubber came from. I got to know Dave Roberts, owner of Broken Sprocket Garage, by stopping by his shop. He was starting to put together some cool builds along with the huge amount of service work he was doing on every make and model of bike. Dave knew I was an artist. He pitched the idea of putting on an art show in his shop. I jumped at the chance. When my wife, Jo, an event planner, found out the event quickly grew into something more. 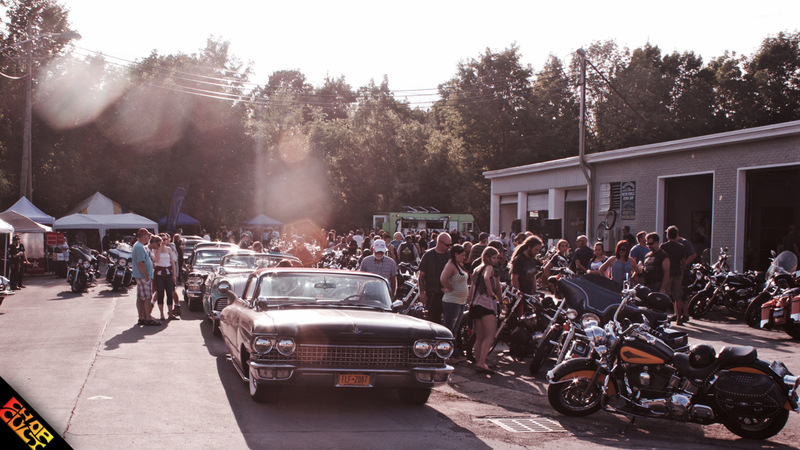 We decided this event would be a way to galvanize all of the bike and car builders during the long, cold New York winters. We would create a venue to showcase their creativity and meet with other like- minded individuals. The first year we drew over 200 people to the show. The next year we drew over 500. On July 25th, we put on Voodoo and Burnt Rubber III. The crowd was easily over 700, with people coming from Buffalo, Rochester, Syracuse, Pittsburgh, Cleveland and Boston. I guess our idea is starting to catch on. 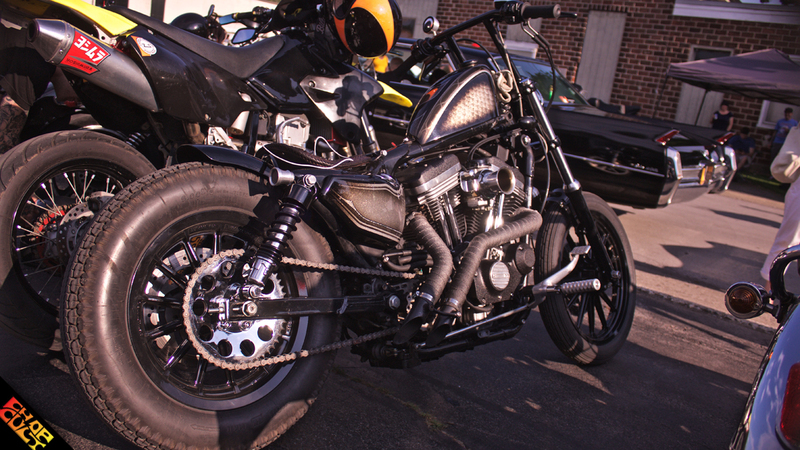 The show not only showcased the mechanical work of Dave at Broken Sprocket Garage, but also builders from Kustom Research, Old Soul Hotrod Shop and Kustom Workz. A myriad of garage builders showed their work as well. Rob Alsheimer II, Bill Battaglia, Jay Cagney, Viktoria Ciostek, Christopher Galley, Elyssa Harper, Orrin Pava and Mikey Revolt lined the shop walls with new artwork and photography. Be sure to check out what these artists are putting together. You’ll be glad you did! Their creativity is driving the cultural shift we are currently experiencing in the chopper scene. The vendor row featured more art, sponsor booths, and Choppahead Bryan Povar’s charming smile. Buffalo’s own Blue Ribbon Bastards handled the music. If you don’t know them, you should definitely check them out. They put on a hell of a show! VBR III also featured a raffle for over 50 different prize baskets. The prizes included one-off bars from both Bowman Motorcycles and Kustom Research, a new Alien tank from Lowbrow Customs, and a $180 gift card from Biltwell. That was only a fraction of the amazing prizes generously donated by our sponsors. Our sponsors are some of the most supportive and giving people in the industry. Please continue to support what they do. The prizes not only provided the homebuilder with some supplies, but also some inspiration. All of the proceeds from the raffle were donated to The Rural Outreach Center and Pets for Vets. VBR III also hosted a 50/50 drawing with the proceeds going to help Paul and Nic Wideman rebuild Bare Knuckle Choppers. Their shop was destroyed by a tornado earlier this summer. The night ended with the proper amount of tire smoke and smiling faces! Keep your eyes open for details on Voodoo and Burnt Rubber IV. There are some big changes in the works as we keep working to outdo ourselves with each successive event. We’re working hard to put Buffalo on the map for more than greasy food and disappointing sports seasons! Before I sign off I want to be sure and thank Dave and Jo for all of their hard work and long hours putting these shows together. I also want to thank all of our sponsors for their continued support. I especially want to thank ChopCult for their tireless efforts to promote this show. Without ChopCult we would not be able to get the word out to so many builders. We will be spending this winter working on the 1988 Harley Davidson Sportster give away bike. You can be sure that Dave, at Broken Sprocket Garage, has a few tricks up his sleeve for it and I will be adding a custom paint job to top off the build. You can keep track of the progress on Instagram with the hashtag #VBRrafflebike. This will surely be something that you haven’t seen before! Stay tuned to http://voodooandburntrubber.weebly.com for all of the details and updates on VBR IV. We’ll see you in sunny Buffalo next summer! I had a blast having beers, hanging out with buds, and making new friends at Voodoo and Burnt Rubber. It was such a good vibe and great time. I can't wait for next year! seen a cone shovel with shocks and a spring seat WTF who took that photo ? This fest,,,along with the one in Philly, Are 2 I have on my schedule for this upcoming summer. My bike is coming along well and I am getting pretty humped of riding the hell outta it. See y'all at those 2 events I hope. 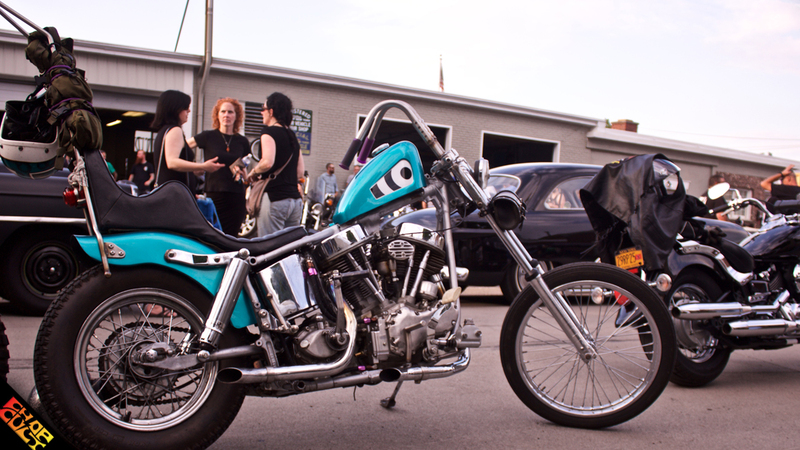 Thanks Chopcult for the coverage of the event at my shop, Broken Sprocket Garage. Thanks Jesse Ladowski for all the photos. Thanks to all the sponsors and people who bought raffle tickets, we greatly increased our contributions to Pets for Vets and The Rural Outreach Center. Thanks to my co-conspirators Chris And Joanne Galley from Devil Chicken Design. We are already planning for a bigger better VBR IV in Buffalo NY! Anyone considering making the trip to Buffalo, do it, you won't be disappointed in our resurrected city! VBR IV will be on Saturday, July 23, 2016. We are moving the event to downtown Buffalo to accommodate our ever increasing numbers of attendees. Stay tuned to http://voodooandburntrubber.weebly.com/ for details! ha I've got a shop maybe an hour away and as far as i know 3 of our builds rolling around up there had no idea this was going on in our neck of the woods definitely on the list for next season.